Thanks to its ease of use and reliability, CDR PalmOilTester is employed by palm oil producers in Asia, Africa and South America during all production stages. Furthermore, CDR PalmOilTester is used in testing laboratories or directly on production lines in many food industries worldwide that use palm oil as a cooking oil and shortening or in the manufacture of margarine, non-dairy creamers and ice cream and so on. 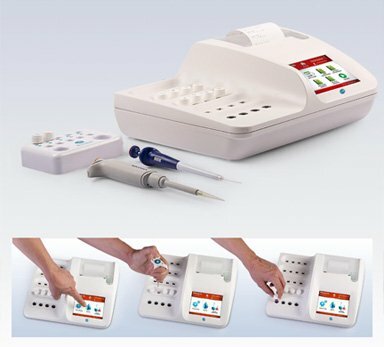 It offers an analytical method that combines reliability of results with a simple and rapid use. How are tests on palm oil performed? Performing chemical analyses on palm oil, either crude or refined, is simple and fast because sample preparation is minimal. All reagents are supplied pre-vialed and ready to use, and operators do not have to handle toxic or carcinogenic compounds; there is no need to wash either containers or traditional glassware. CDR PalmOilTester for Palm Oil was last modified: March 6th, 2019 by CDR s.r.l. What is the CDR PailmOilTester System? An analyzer based on photometric technology, equipped with state-of-the-art LED emitters, reading cells and 37°C thermostated incubation cells. A graphic printer will immediately print the test results..
100 *300560 2 – 100 I.V.